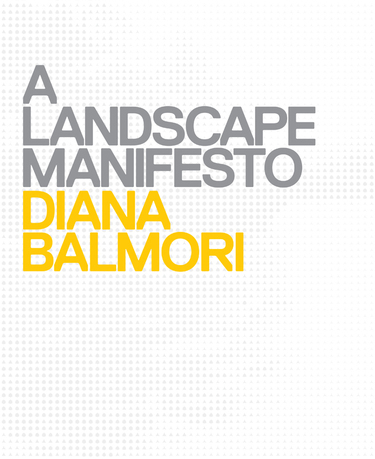 Diana Balmori, A Landscape Manifesto, book cover. 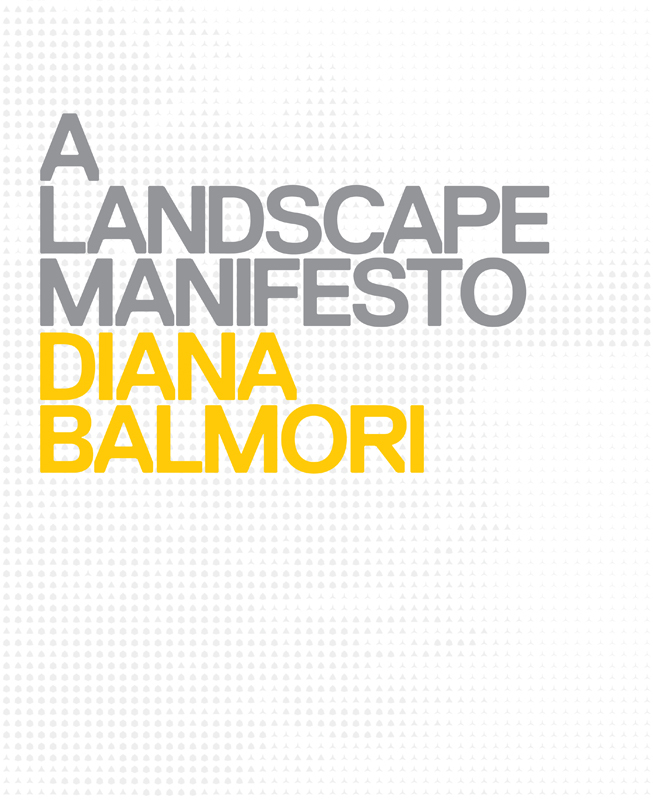 A Landscape Manifesto presents the vision of Diana Balmori, FASLA , an internationally recognized landscape and urban designer, for a new kind of livable city. As the impending dangers of global warming become increasingly evident, Balmori strongly believes that landscape design can, and must, take a leading role in recreating twenty-first-century urban centers. This book outlines emerging sustainable landscape typologies and proposes the critical shifts needed in order for us to create meaningful change. 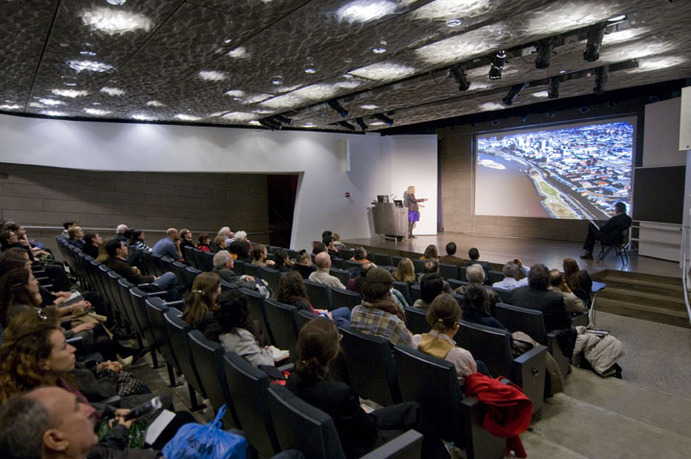 Projects by Balmori Associates, including riverfront projects in Memphis, Tennessee, and in Bilbao, Spain, illuminate the innovations discussed in the text. Published by Yale University Press, A Landscape Manifesto includes discussions of aesthetics, urban ecology, and environmental conservation, and features an Introduction by Michel Conan, one of landscape architecture's most respected historians. Throughout Diana Balmori's professional career, she has extensively pursued the aesthetic of landscape and researched the fields of urban design, landscape architecture, ecology, and sustainability, bringing this knowledge to her New York-based landscape and urban design firm. Founded in 1990, Balmori Associates' projects range in scale from waterfront master plans and urban plazas to residential gardens and green roofs. 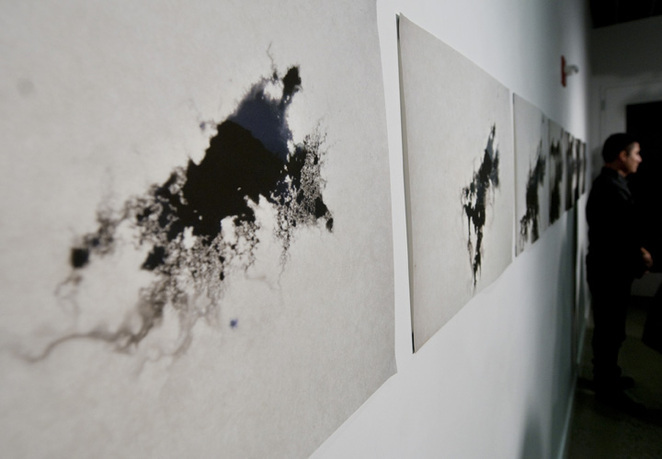 Balmori is an educator, as well as a practitioner, and she holds a joint appointment with the Yale School of Architecture and the Yale School of Forestry and Environmental Studies. In addition to teaching at Yale University in both the School of Architecture and the School of Forestry and Environmental studies, she has lectured and published extensively. Her most recent book is Groundwork: Between Landscape and Architecture, written with Joel Sanders (Random House, September 2011). 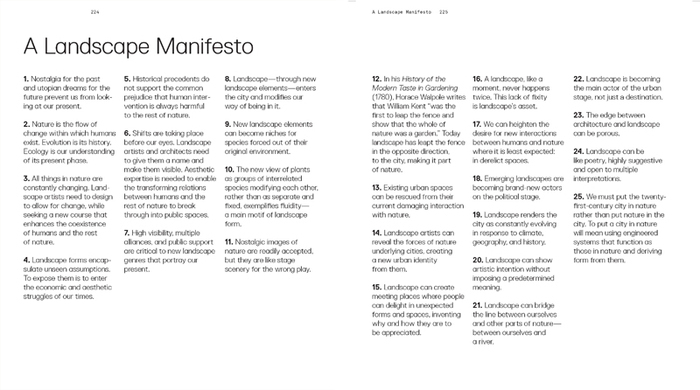 A Landscape Manifesto was published by Yale University Press (2010). She is the co-author of many books, such as Saarinen Garden: A Total Work of Art; Redesigning the American Lawn: A Search for Environmental Harmony; Transitory Gardens, Uprooted Lives; The Land and Natural Development (LAND) Code: Guidelines for Environmentally Sustainable Land Development; Beatrix Farrand, American Landscapes; Garden and Campus Designs.